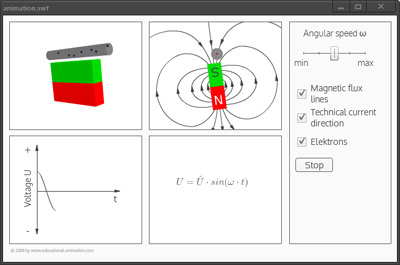 The interactive animation illustrates the principle of electromagnetic induction using a rotating magnet as an example. 3D model of a conductor and a rotating magnet. Inside the conductor, electrons are shown. As the magnet rotates, the electrons in the conductor are set in motion. The 3D model in a profile view. The technical current direction is represented by symbols. In addition, the field lines of the magnetic field can also be displayed. The curve shows the height of the induced voltage in the course of time. The curve is dynamically updated. The formula shows how the induced voltage is calculated.